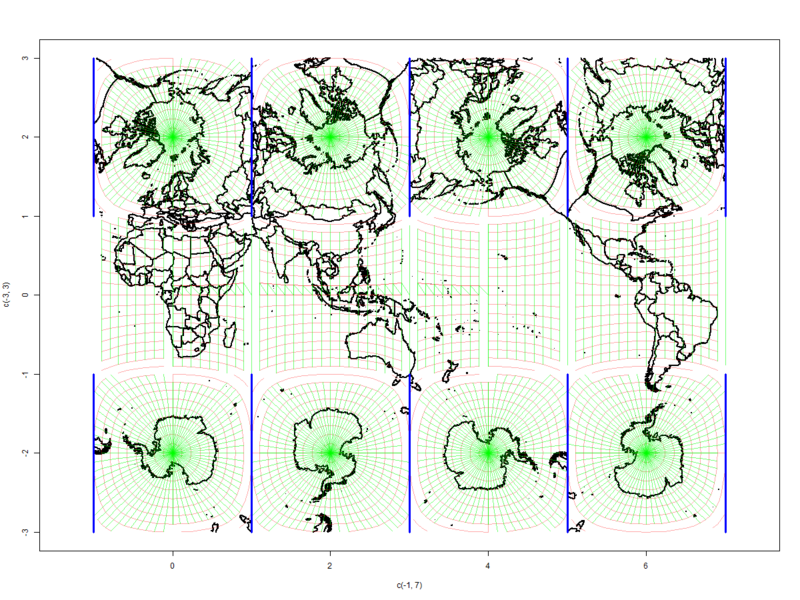 I have been experimenting with maps that are a byproduct of my systematising a cubed sphere grid. I thought it would give a better perspective on the distribution of surface stations and their gaps, especially with the poles. So here are plots of the stations, land and sea, which have reported April 2017 data, as used in TempLS. The ERSST data has already undergone some culling. So now there are too many Africa's. However, between them you get a picture of coverage good and bad. Of course, then the question is to quantify the effect of the gaps. 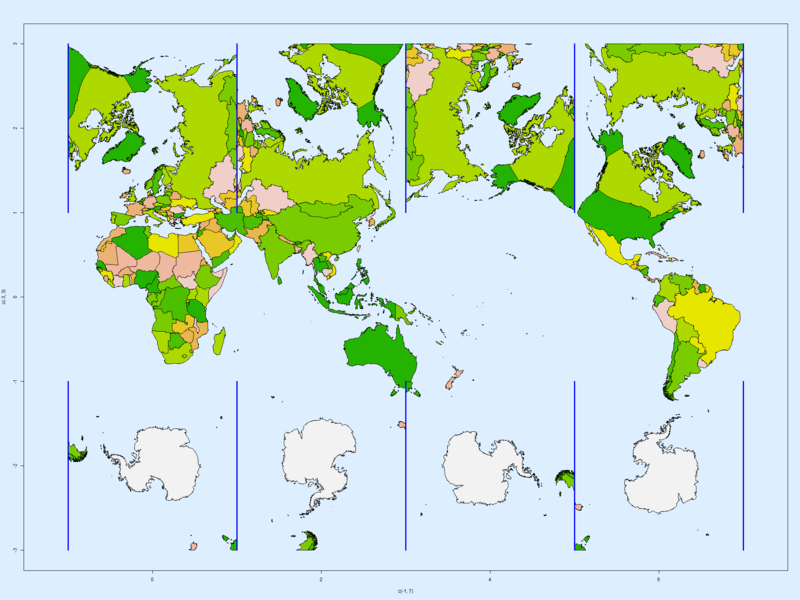 In my last post, I showed an equal area world map projection that was a by-product of the cubed sphere gridding of the Earth's surface. It was an outline plot, which makes it a bit harder to read. Producing a colored plot was tricky, because the coloring process in R requires an intact loop, which ends where it started, and the process of unfolding the cube onto which the map is initially projected makes cuts. So I fiddled more with that, and eventually got it working. I'll show the result below. 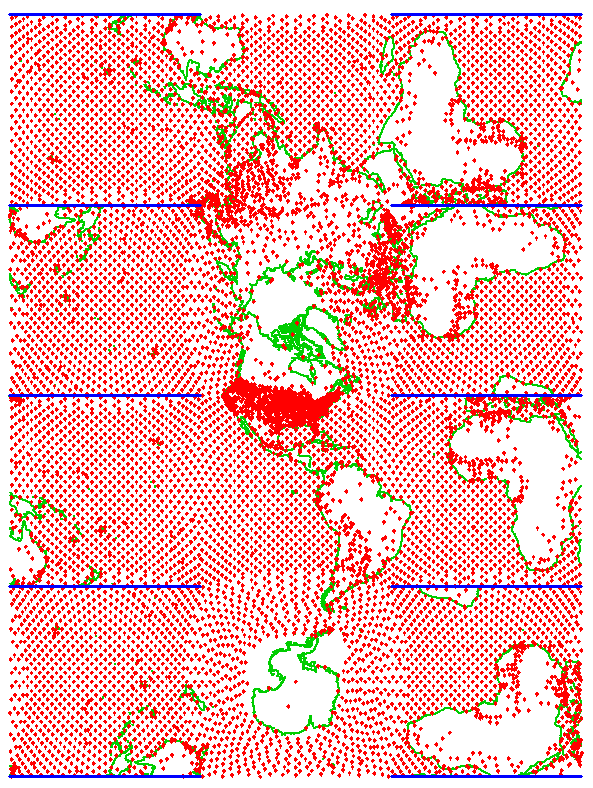 You'll notice more clearly the local distortion near California and Victoria. And it clarifies how stuff gets split up by the cuts marked by blue lines. I haven't shown the lat/lon lines this time; they are much as before. This post follows on from the previous post, which described the cubed sphere mapping which preserves areas in taking a surface grid from cube to sphere. I should apologise here for messing up the links for the associated WebGL plot for that post. I had linked to a local file version of the master JS file, so while it worked for me, I now realise that it wouldn't work elsewhere. I've fixed that. 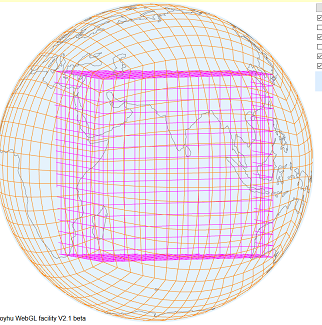 If you have an area preserving plot onto the flat surfaces of a (paper) cube, then you only have to unfold the cube to get an equal-area map of the world on a page. It necessarily has distortion, and of course the cuts you make in taking apart the cube. But the area preserving aspect is interesting. So I'll show here how it works. I've repeated the top and bottom of the cube, so you see multiple poles. 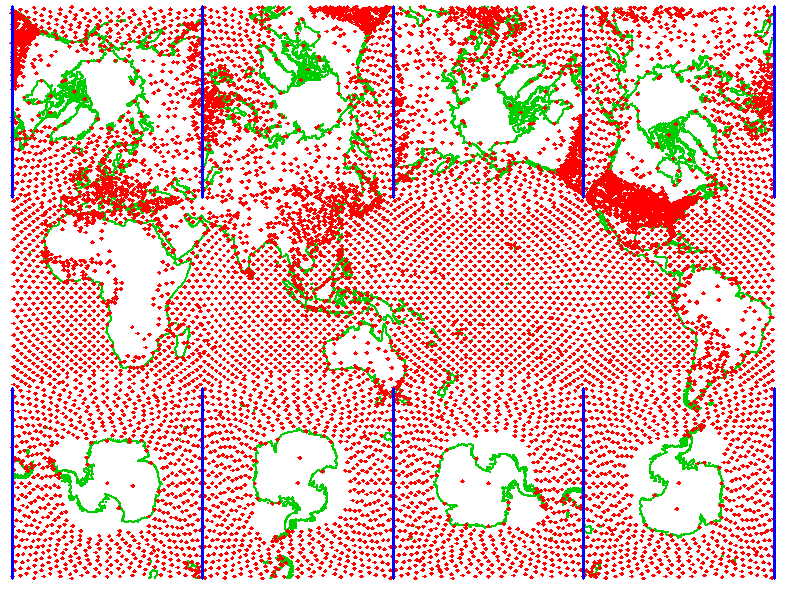 Red lines are latitudes, green longitudes. The blue lines indicate the cuts in unfolding the cube, and you should try to not let your eye wander across them, because there is confusing duplication. And there is necessarily distortion near the ends of the lines. But it is an equal area map. Well, almost. I'm using the single parameter tan() mapping from the previous post. I have been spending far too much time developing almost perfectly 1:1 area mappings. But I doubt they would make a noticeable difference. I may write about that soon, but it is rather geekish stuff. GISS May unchanged from April - second warmest May on record. As with TempLS, GISS showed May unchanged from April, at 0.88°C. Although that is down from the extreme warmth of Feb-Mar, it is still very warm historically. In fact, it isn't far behind the 0.93°C of May 2016. 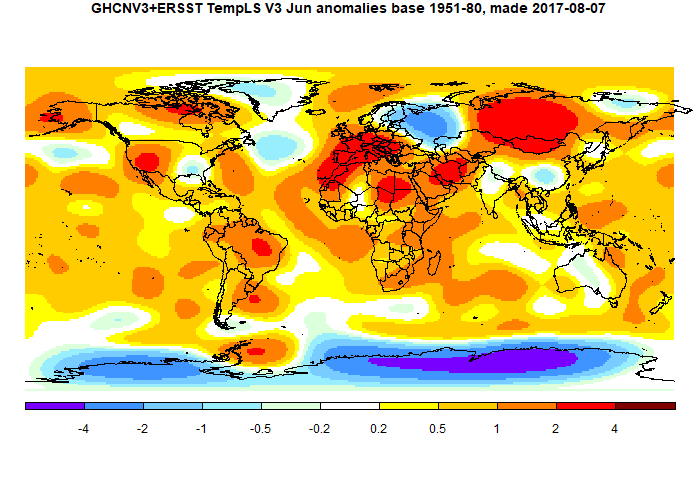 June looks like being cooler, which reduces the likelihood of 2017 exceeding 2016 overall. The overall pattern was similar to that in TempLS. A big warm band from N of China to Morocco (hot), with warmth in Europe, and cold in NW Russia. Wark Alaska, coolish Arctic and Antarctica mixed. 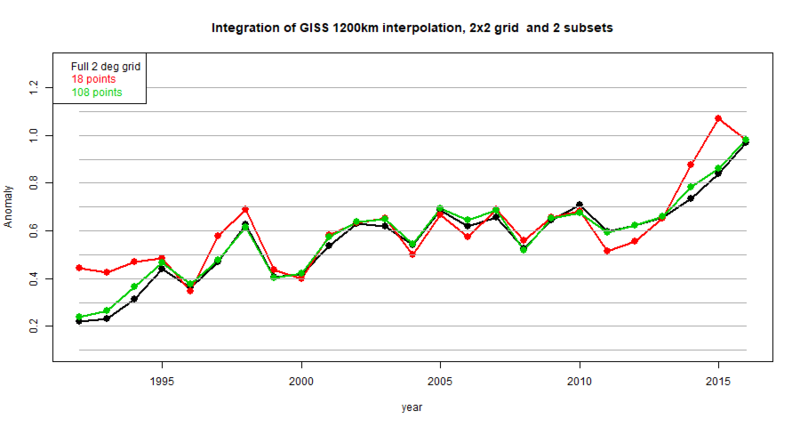 As usual, I will compare the GISS and previous TempLS plots below the jump. I've been intermittently commenting on a thread on the long-quiet Climate Audit site. 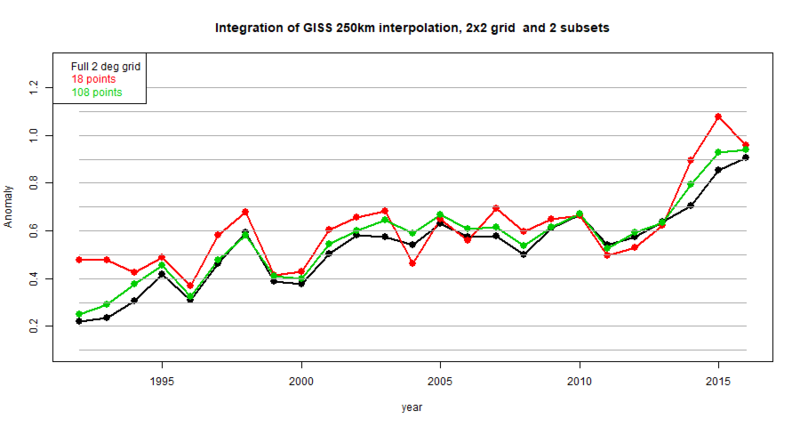 Nic Lewis was showing some interesting analysis on the effect of interpolation length in GISS, using the Python version of GISS code that he has running. So the talk turned to numerical integration, with the usual grumblers saying that it is all too complicated to be done by any but a trusted few (who actually don't seem to know how it is done). Never enough data etc. He made it last year, so it runs to 2015. There was much scepticism there, and some aspersions, so I set out to emulate it, and of course, it was right. My plots and code are here, and the graph alone is here. I should add that this is the very simplest grid integration, with no use of enlightened infilling, which would help considerably. The code is here. This is a somewhat different problem from my intermittent search for a 60-station subset. There has already been smoothing in gridding. But it shows that the spatial and temporal fluctuations that we focus on in individual maps are much diminished when aggregated over time or space. TempLS mesh was virtually unchanged , from 0.722°C to 0.725°C. This follows the smallish rise of 0.06°C in the NCEP/NCAR index, and larger rises in the satellite indices. The May temperature is still warm, in fact, not much less than May 2016 (0.763°C). But it puts 2017 to date now a little below the annual average for 2016. So far in 2017, in the Moyhu NCEP/NCAR index, January to March were very warm, but April was a lot cooler. May recovered a little, rising from 0.34 to 0.4°C, on the 1994-2013 anomaly base. This is still warm by historic standards, ahead of all annual averages before 2016, but it diminishes the likelihood that 2017 will be warmer than 2016. There were few notable patterns of hot and cold - cold in central Russia and US, but warm in western US, etc. 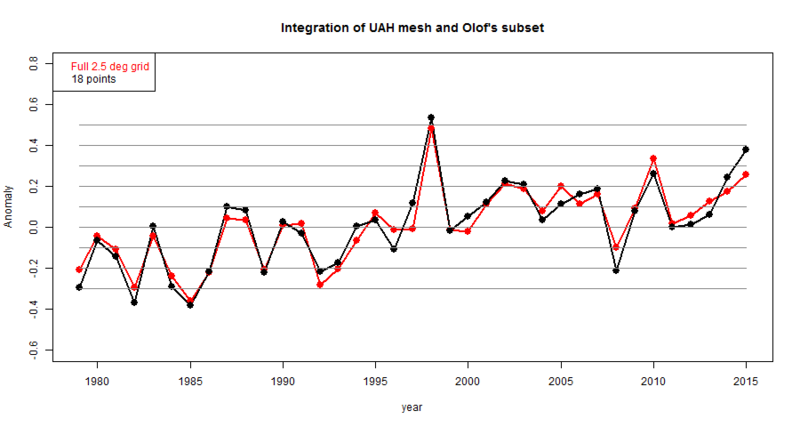 The Arctic was fairly neutral, which may explain the fairly slow melting of the ice..
Update - UAH lower troposphere V6 ;rose considerably, from 0.27°C to 0.45°C in May.